Elsa, princess of Arendelle, possesses the ability to create ice and snow. One night while playing, she accidentally freezes her younger sister Anna with her powers causing a small part of her hair to turn white. The king (Maurice LaMarche) and queen seek help from trolls, who heal Anna and remove her memories of her sister's magic. Their leader, Grand Pabbie (Ciarán Hinds), informs them that if Elsa had struck Anna's heart it would have been fatal. In order to protect Elsa and avoid her powers from endangering anyone else, the royal family locks themselves away in their castle. Elsa, afraid of hurting Anna again, spends most of her time hiding in her room, creating a rift between the two sisters as they grow up. 10 years later, their parents are killed at sea during a storm. Three years after the death of their parents, the people of Arendelle prepare for Elsa's (IdinaMenzel) coronation ceremony. Among the dignitaries is the Duke of Weselton (Alan Tudyk), a tradesman who wants to exploit Arendelle for profit. Excited that the castle's gates will finally open to the public, Anna (Kristen Bell), expresses her hopes of falling in love with someone. Strolling through the streets, she meets Prince Hans (Santino Fontana) of the Southern Isles, and the pair quickly develop a mutual attraction for each other. Despite Elsa's concerns, the coronation goes off without incident, and the two sisters begin to bond at the reception party. During the reception, Hans proposes to Anna, who immediately accepts. Elsa, however, refuses to grant her blessing on the marriage, setting off an argument between the sisters, which culminates in Elsa's cryokinetic abilities being exposed to the guests. Panicking, Elsa flees inadvertently unleash an eternal winter on the kingdom in the process. 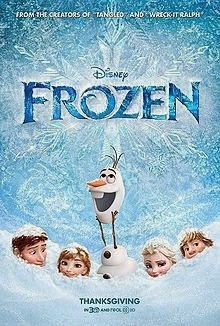 After coming to terms with her secret being out, she rejoices that she no longer has to be afraid of her abilities, building herself an ice palace and unknowingly bringing to life hers and Anna's childhood snowman Olaf (Josh Gad). Anna sets out in search of Elsa, determined to return her to Arendelle, end the winter, and mend their relationship. While getting supplies at Oaken's (Chris Williams) Trading Post, she meetsmountain man Kristoff (Jonathan Groff) and his reindeer Sven. Anna convinces Kristoff to guide her to the North Mountain. After an attack from wolves, the pair encounter Olaf who leads the group to Elsa's hideaway. Loosely based on Hans Christian Andersen's fairy tale The Snow Queen, the film tells the story of a fearless princess who sets off on an epic journey alongside a rugged, thrill-seeking mountain man, his loyal pet reindeer, and a hapless snowman to find her estranged sister, whose icy powers have trapped the kingdom in eternal winter. The movie's music and artwork is heavily inspired by Norwegian and Sámi culture. Liked the above description from Wikipedia as it summarizes the whole movie exactly. The animations were lovely, the storyline attractive, the songs fantastic! Loved the movie whole-heartedly. Can't help humming to the tune 'Let it go' non-stop... so catchy and empowering! Truly a beautiful movie for all little princesses... I know my Princess loved it! Unfortunately not so exciting for the boys... my Tyger yawned throughout the movie =.= Anyway, well done, Disney! Another fantastic animation after Tangled!